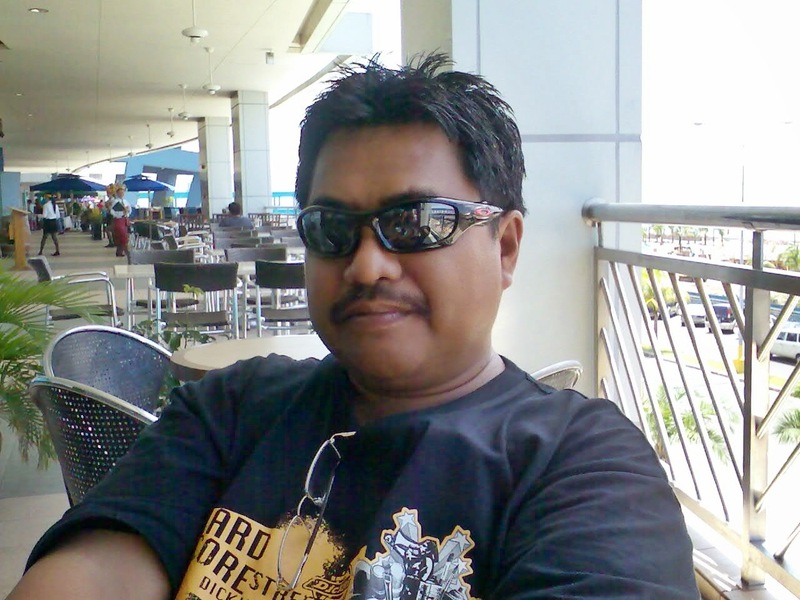 Crispy Sisig. Today I want to share a fried version of the sisig. The ingredients are deep fried instead of the usual grilling. The basic ingredient and cooking method are similar to my previous sisig recipe (click here to see the previous sisig post) except of course the pork and liver ingredients are deep fried instead of grilling. The frying method may not mean a lot in terms of ease of cooking compared to grilling because of the added danger of hot oil splashing during frying. It is however more convenient if you live in an apartment or a condominium where there is no place for outdoor barbecue. And hate the smoke that seems to clink to the walls forever. Not unless of course if you have an oven but that will require another separate sisig post in the future. 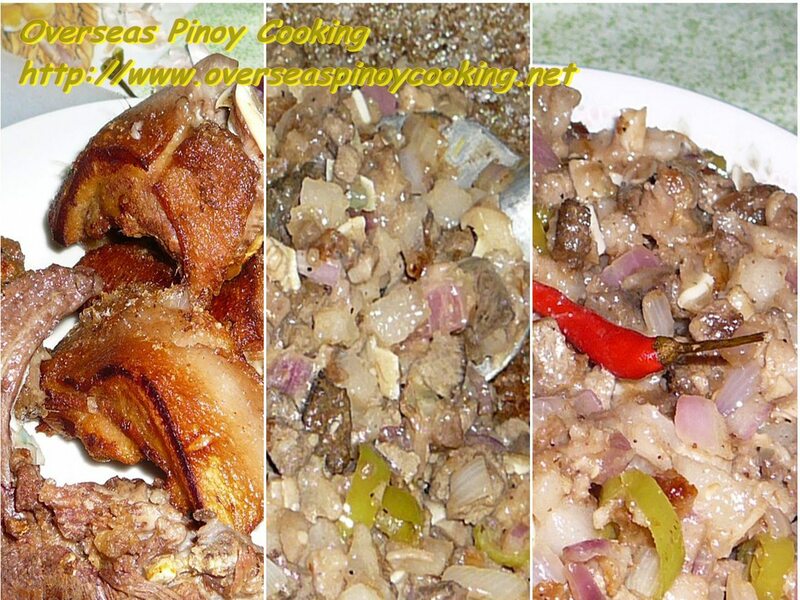 Here is the recipe of my version of Crispy Sisig. In a big pan boil the pig head, peppercorn, bay leaf, crushed garlic and about 1 tsp. of salt for 30 to 45 minutes or until tender and skin can be separated from the skull. On the last 5 to 10 minutes of boiling add in the chicken liver. Remove from the pan and drained in a colander until dry or wipe with paper towels. Separate the meat from the bone and cut head parts into frying size, discard the bones. Chill the pork head parts and the chicken liver in the refrigerator for at least a couple. Deep fry the pork head parts and chicken liver at high heat until the skin are crisp and color has change to golden brown. Let cool down and dice into small cubes. In a big wok stir fry diced face part and liver without oil for 10 to 15 minutes at high heat. Add in 3 to 4 cups of water, bouillon cube, vinegar, soy sauce, liquid seasoning and salt/pepper to taste. Stir cook for 10 to 15 minutes. Add in onions and chili, stir cook for another 3 to 5 minutes. Serve with kalamansi or serve on a sizzling plate with kalamansi and top with egg. 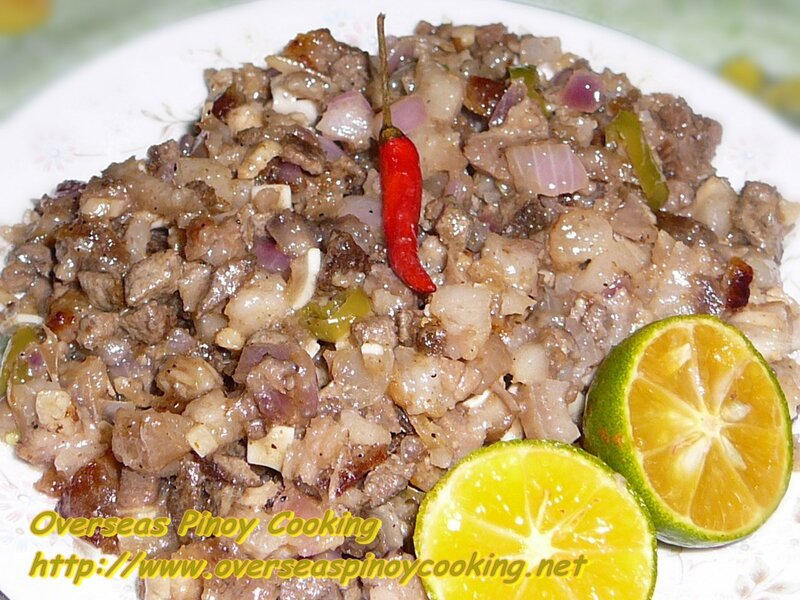 just finish cooking your recipe, it did not turn into crispy sisig, but really good though. how to make it crispy?